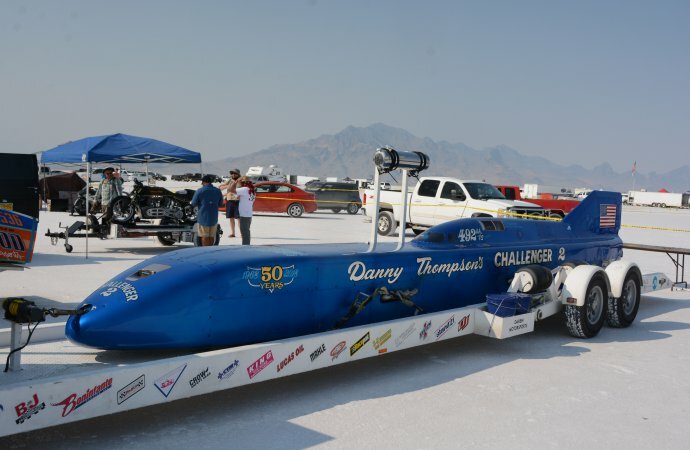 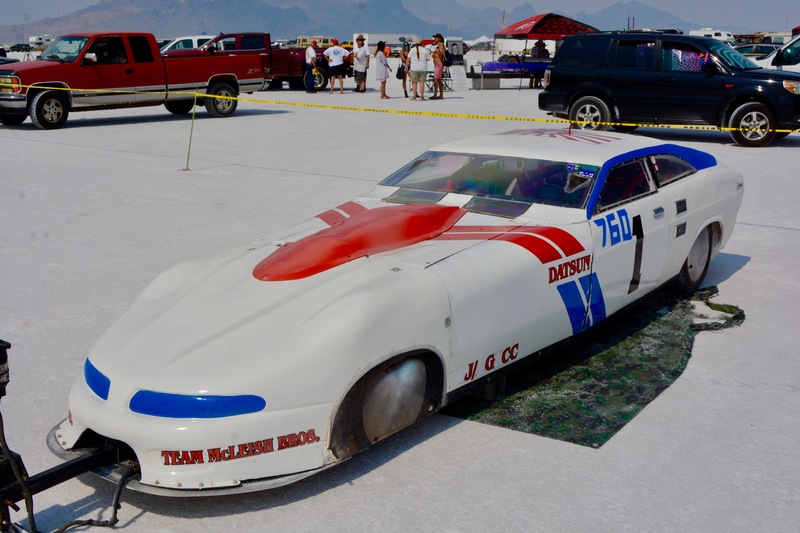 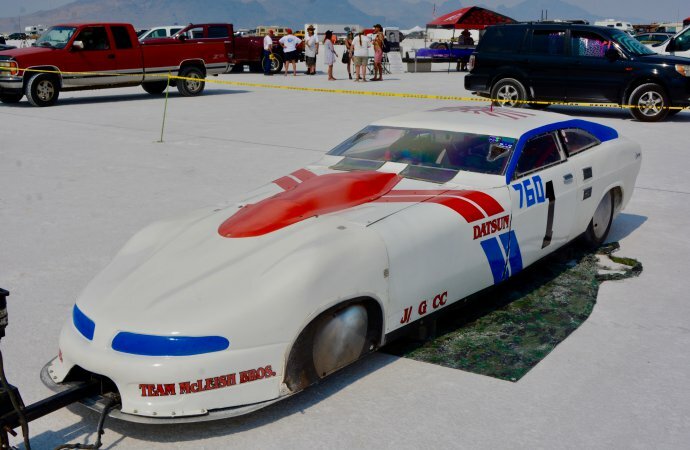 The star of the show was Danny Thompson’s Challenger 2 streamliner, handily eclipsing his famous father Mickey Thompson’s 406 mph run with a run of 448 mph! 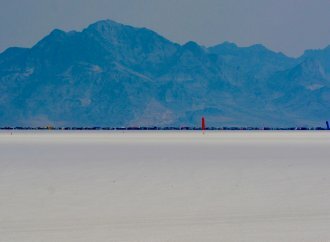 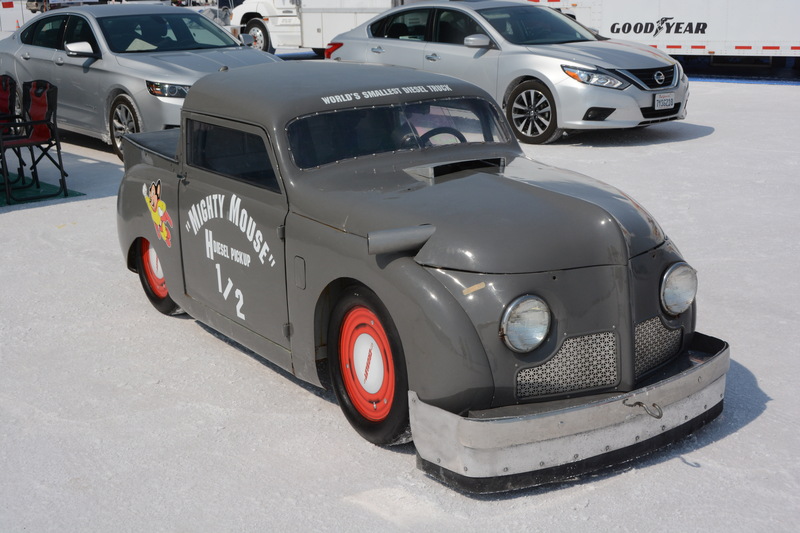 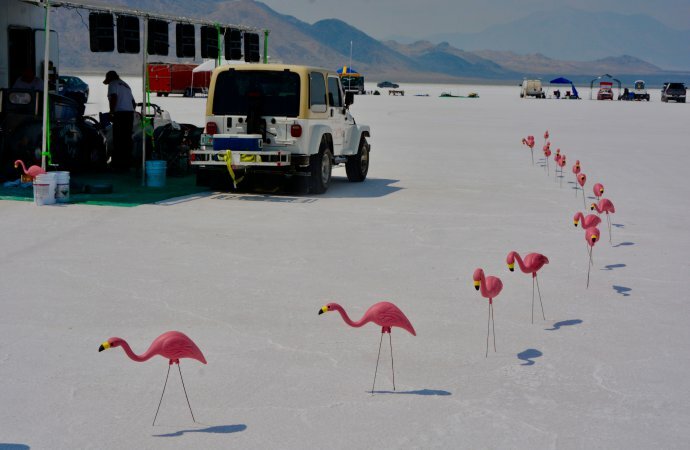 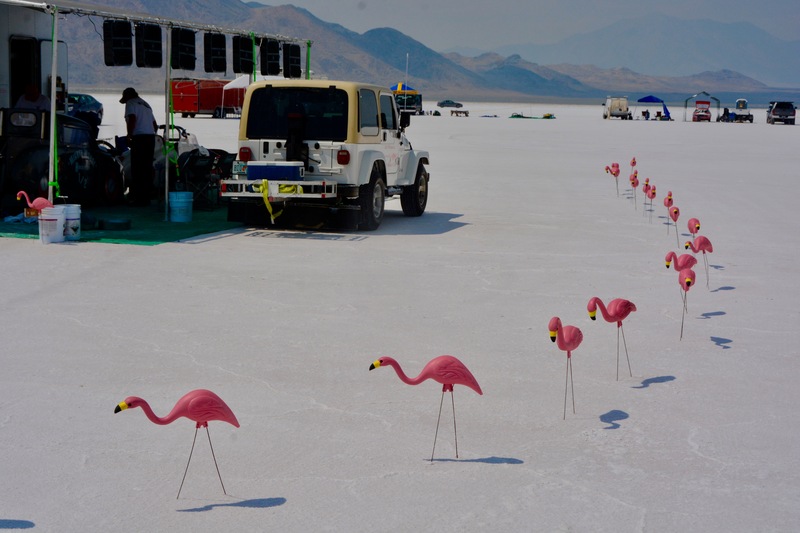 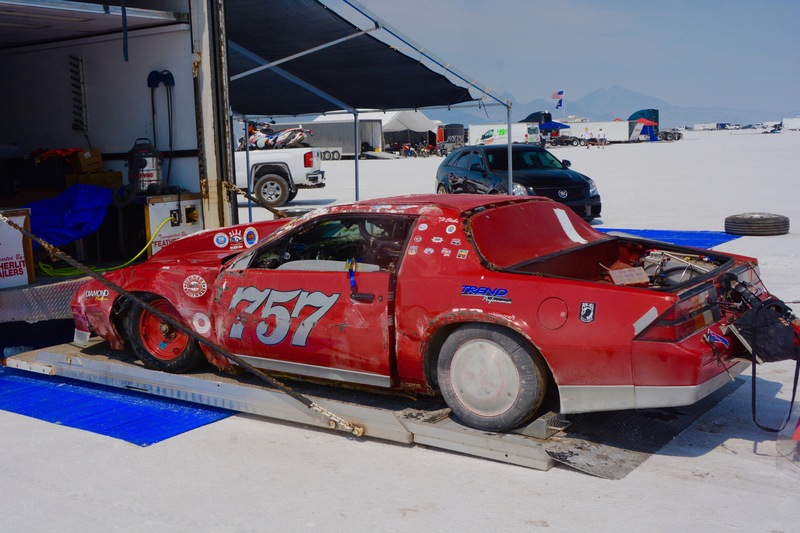 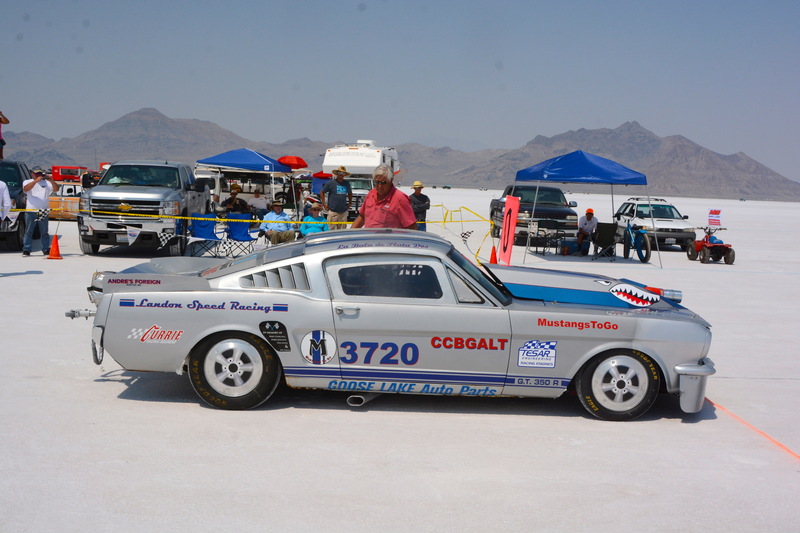 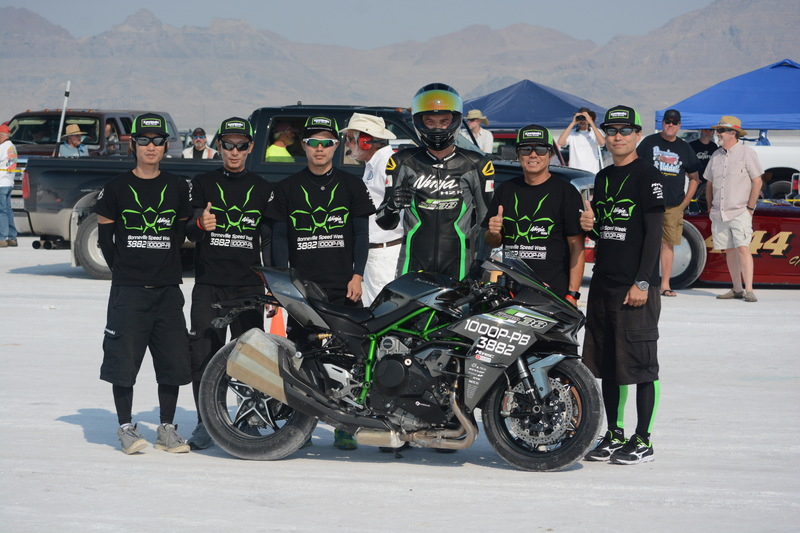 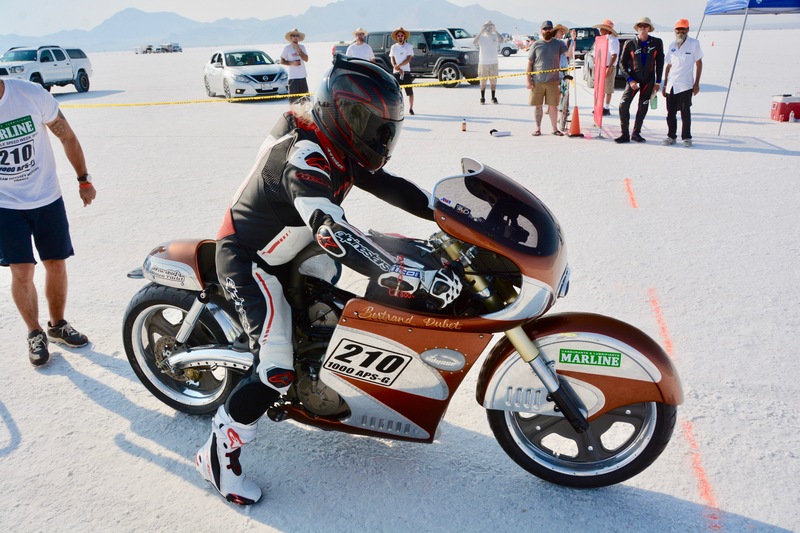 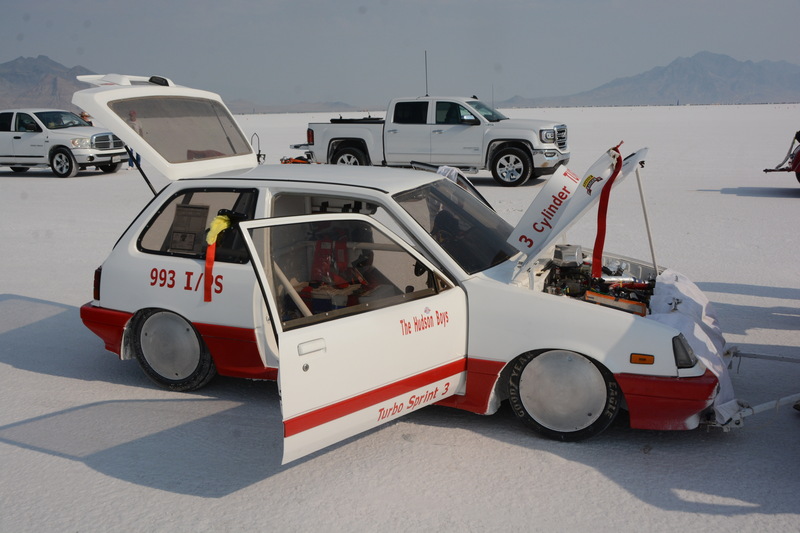 Every August, racers converge on the huge Bonneville Salt Flats outside Wendover, Utah, to battle the heat, the salt and each other. 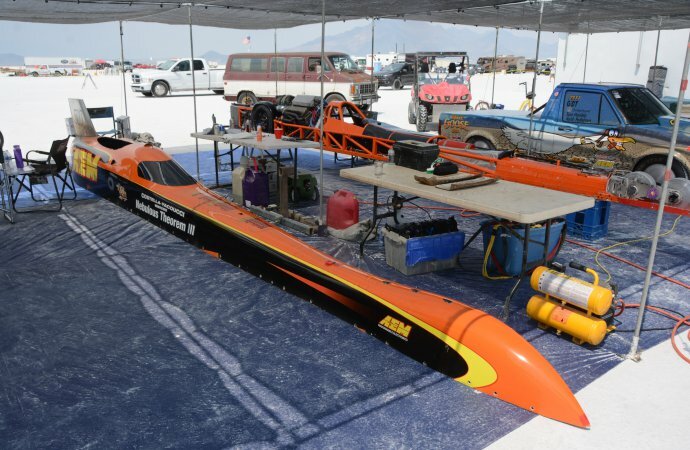 They come to this mecca of speed, The Fastest Place On Earth, to set speed records, or at least to try. 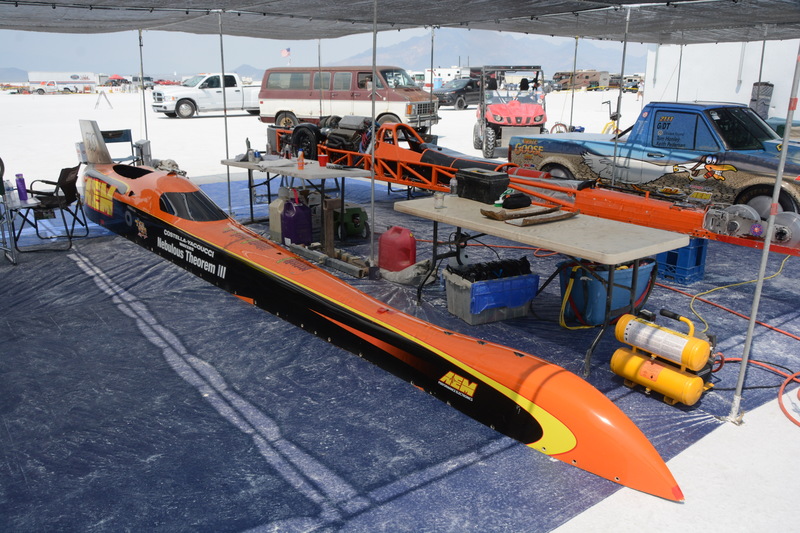 The variety of machinery in the pits at this place is unrivaled anywhere in the world, 430 entries this year. 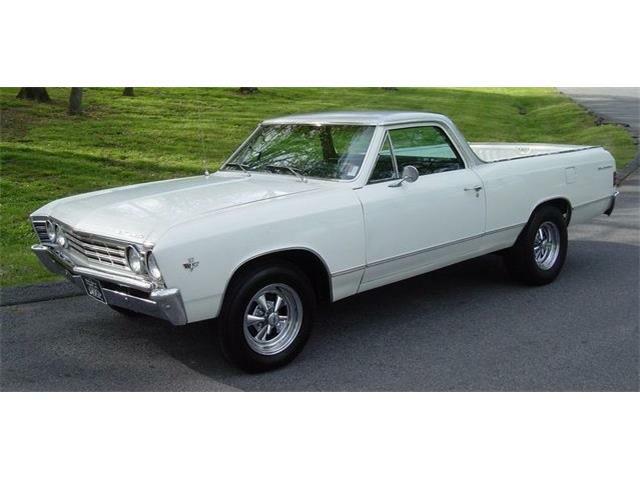 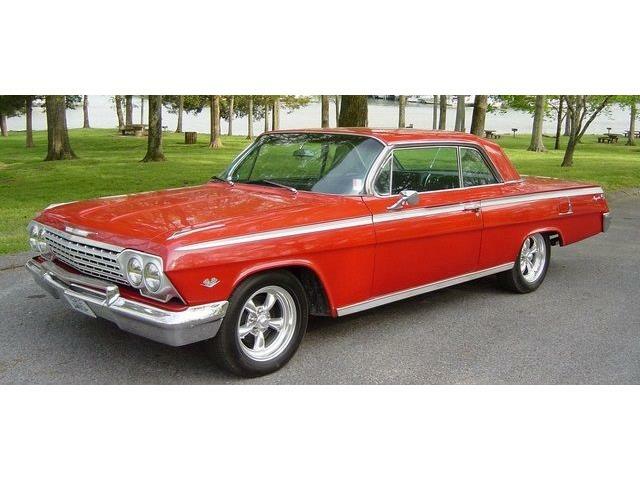 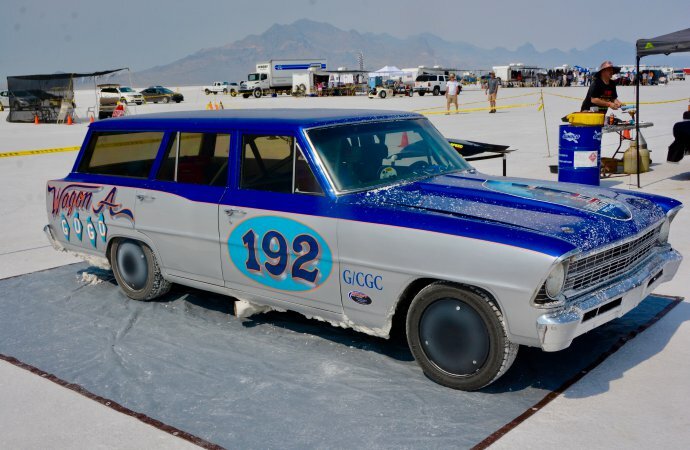 There are so many classes, set up by the Southern California Timing Association and Bonneville Nationals, Inc., that it’s not unusual here to see a Chevy II station wagon powered by a Mazda rotary engine or a Ford roadster powered by a Cadillac flathead V8. 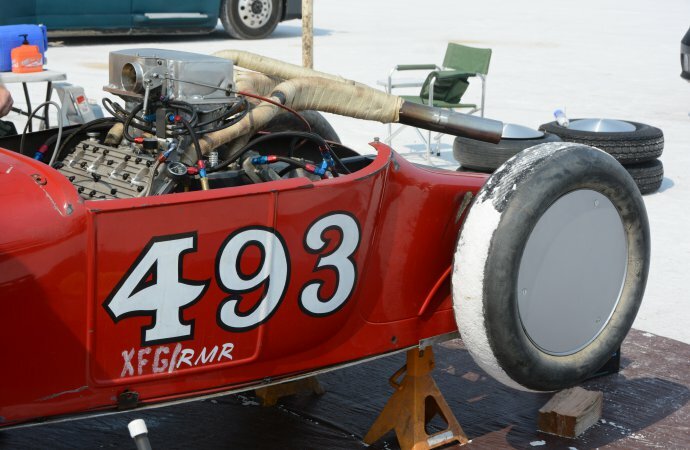 We saw a Ford Model T roadster V8 with eight turbos and a supercharger. 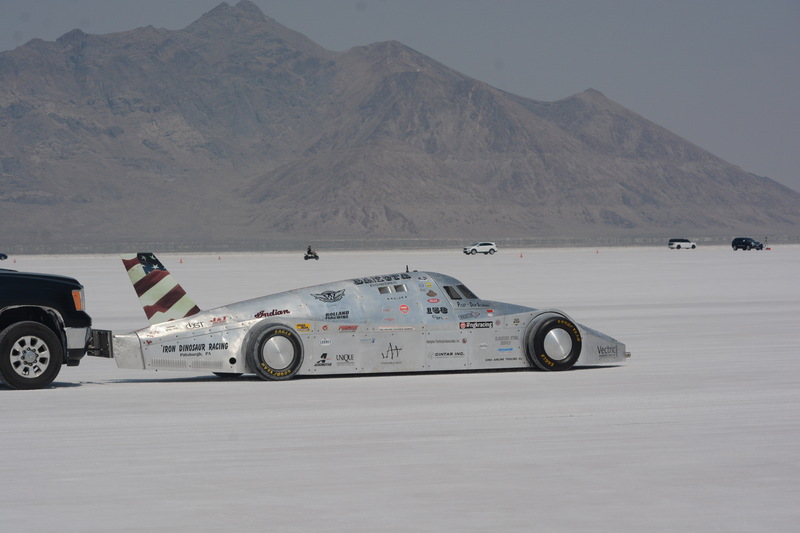 Bonneville Speedway is enormous. Situated in the midst of 40 square miles of flat salt, 4,200 feet above sea level, the course is so long that, from the nine-mile mark at the end, you can’t see the pits because of the curvature of the earth. 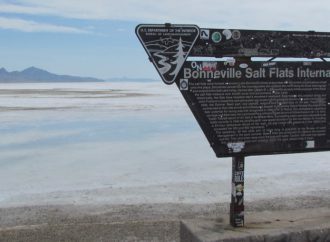 It’s easy to get to, just north of Interstate 80. 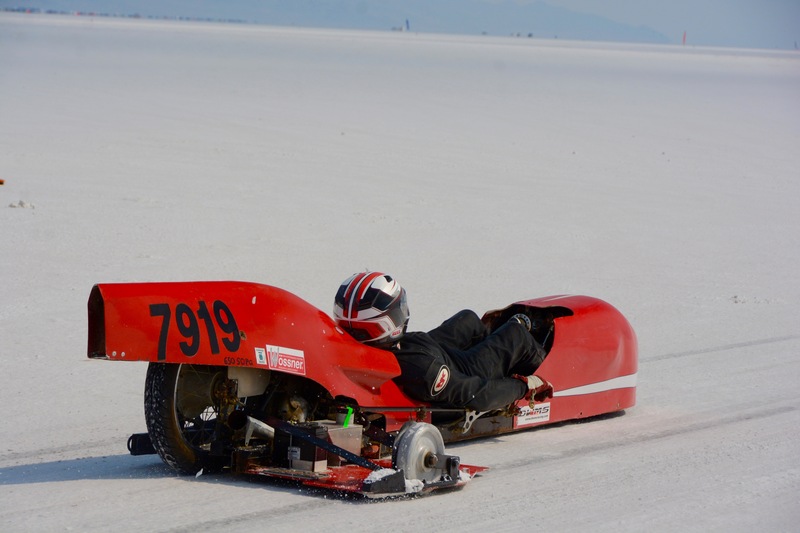 It is also subject to flooding, but this year, the salt was deep, flat, dry and hard, ideal for speed trials. SCTA and BNI have been grooming the four courses for weeks, and setting up all the temporary facilities for a week of fierce competition. 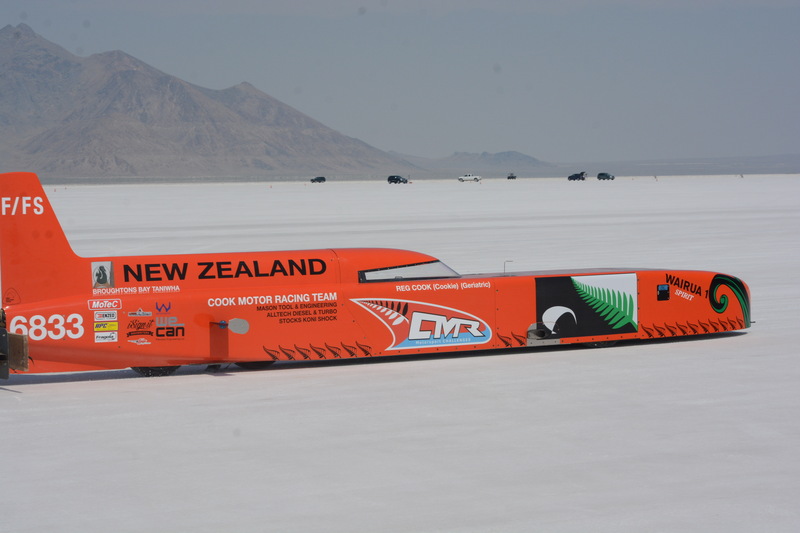 There were teams here from Canada, England, France, Italy, Sweden, Japan, Australia, and New Zealand, making it an international festival of performance and speed. The big guns here are the streamliners, the long, narrow, ultrasophisticated machines carrying as many as four supercharged engines running on nitro fuel. Take Danny Thompson’s Challenger II. 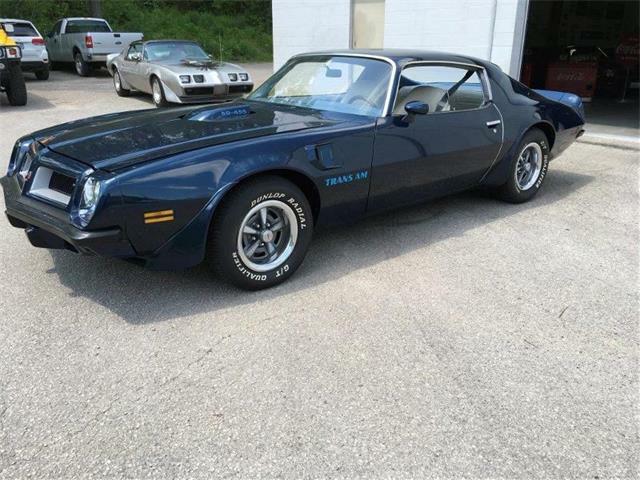 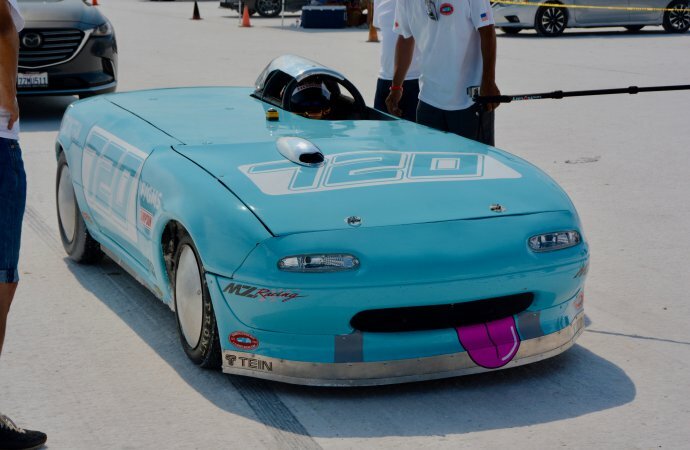 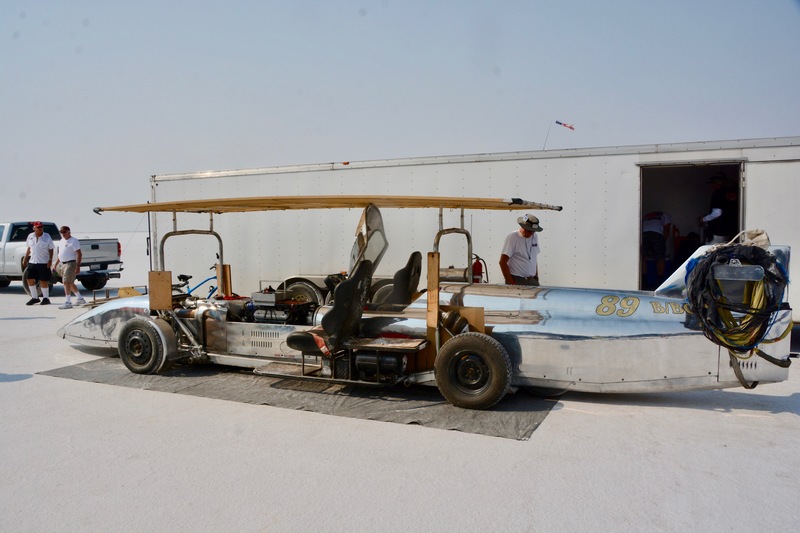 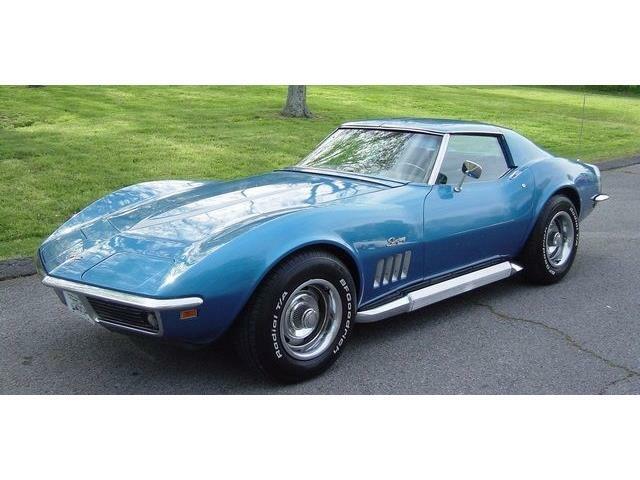 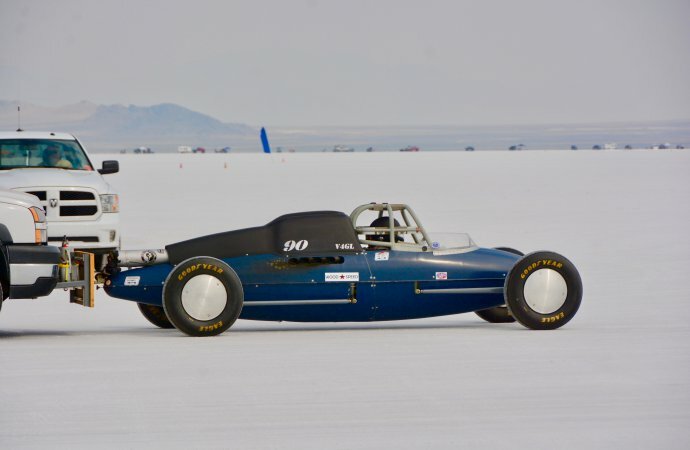 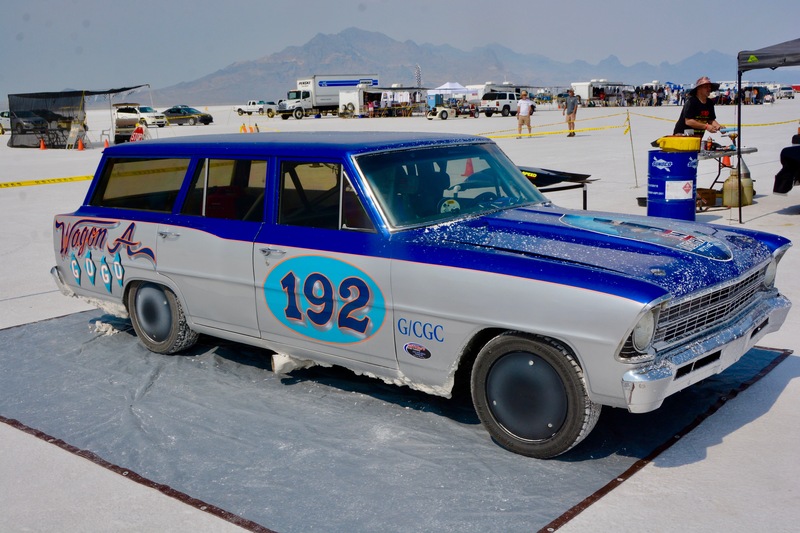 He’s the son of racing legend Mickey Thompson, and, on the second day of competition, he drove his blue bullet to an exit speed on the five-mile course of 460 miles per hour. 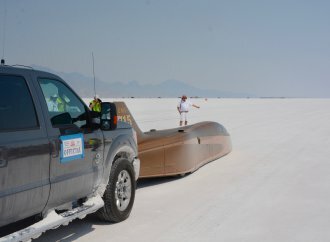 That’s 675 feet per second! 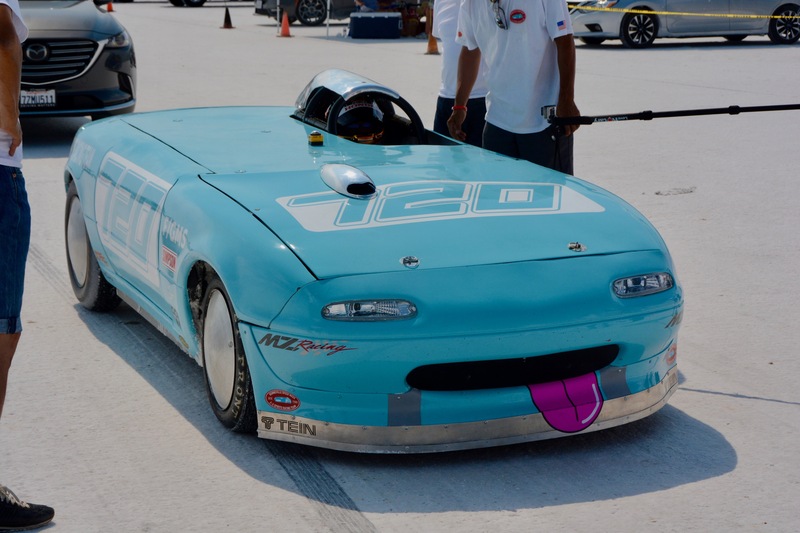 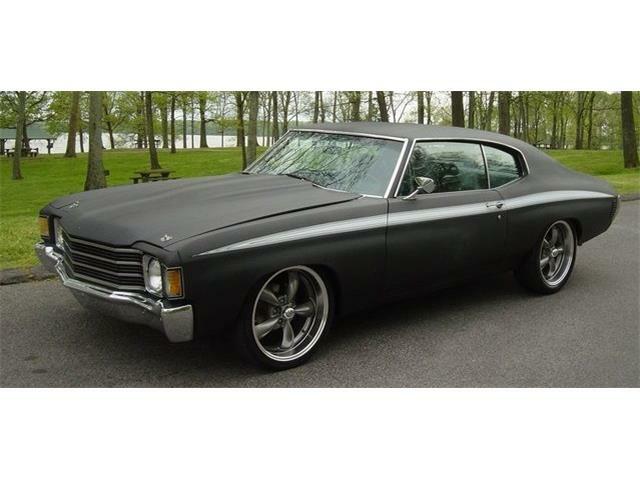 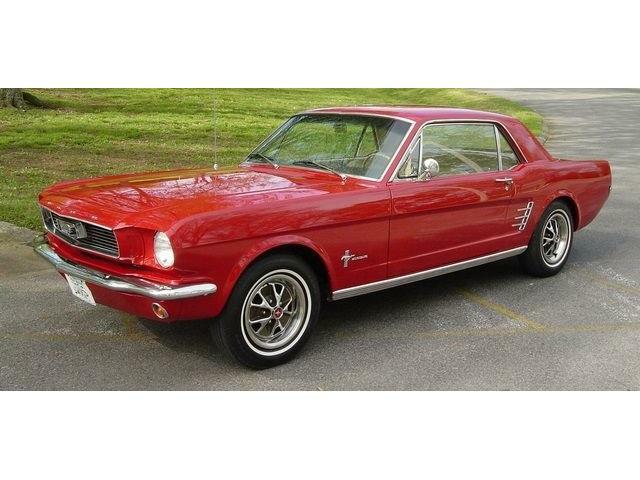 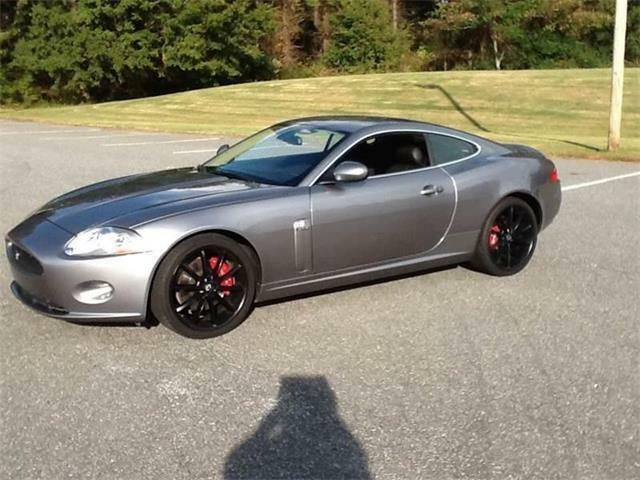 In drag racing terms, that’s zero to five miles in a little over seven seconds. 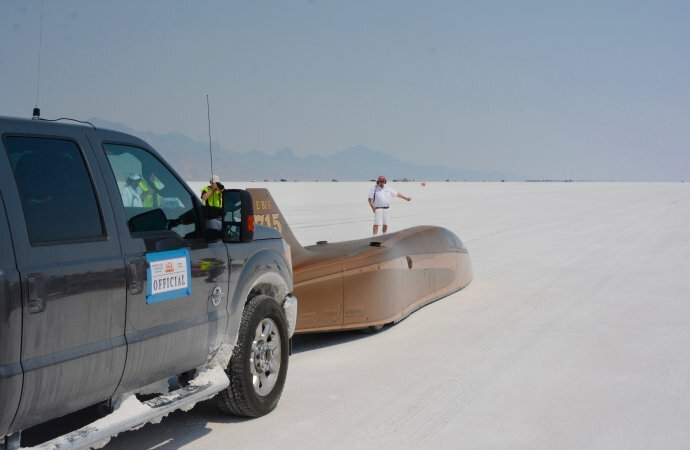 He set a two-run record average of 448.757 mph. 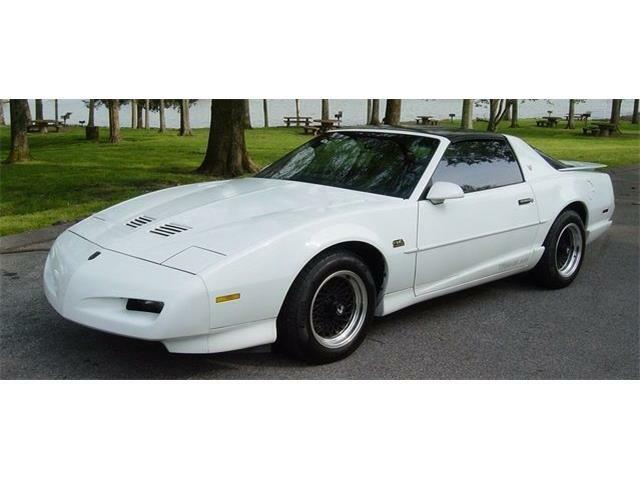 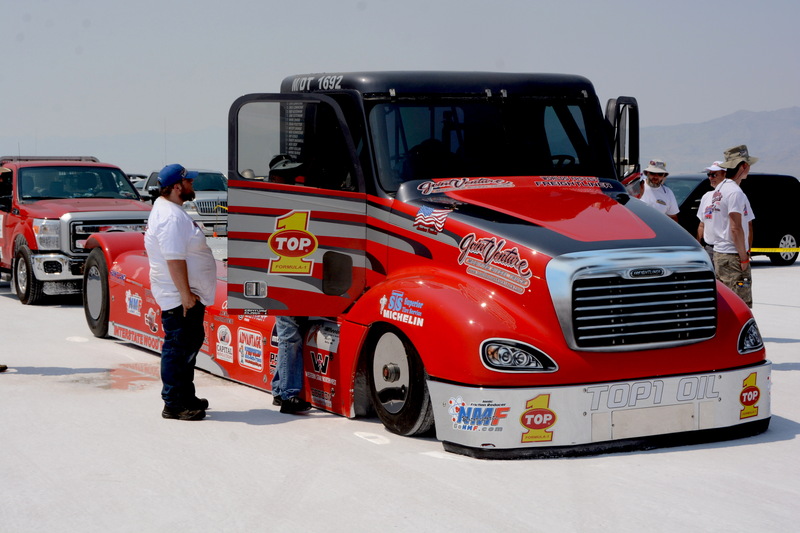 The Poteet & Main Speed Demon then eclipsed Thompson with a 452.255 average. 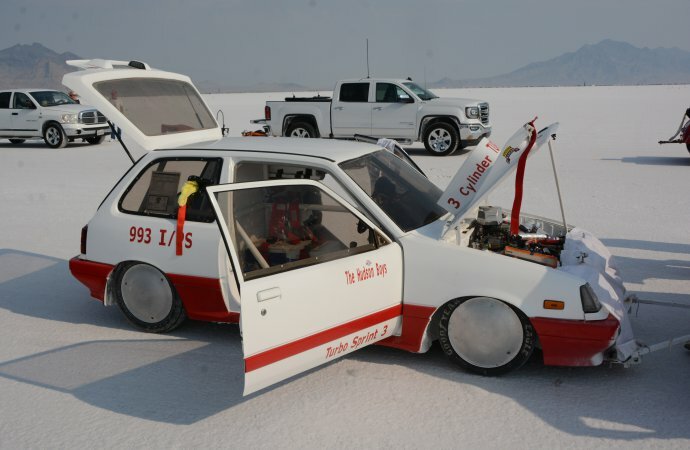 Then the Turbinator turbine car ran 470 mph! 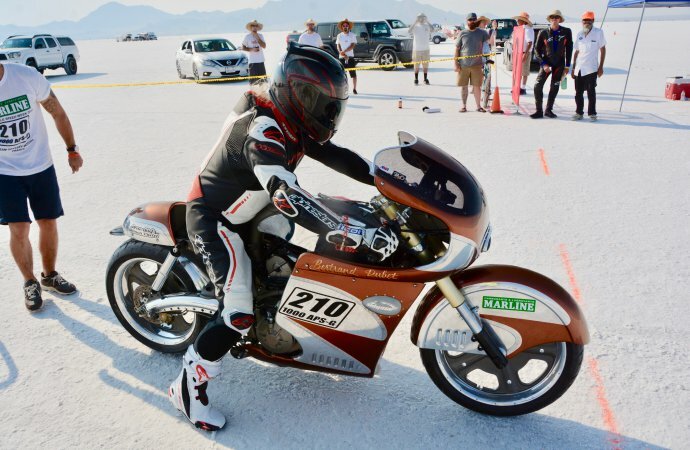 But there are lots of machines here at the other end of the speed spectrum, like 50cc motorcycles, and little, tiny vehicles powered by little tiny diesel engines. 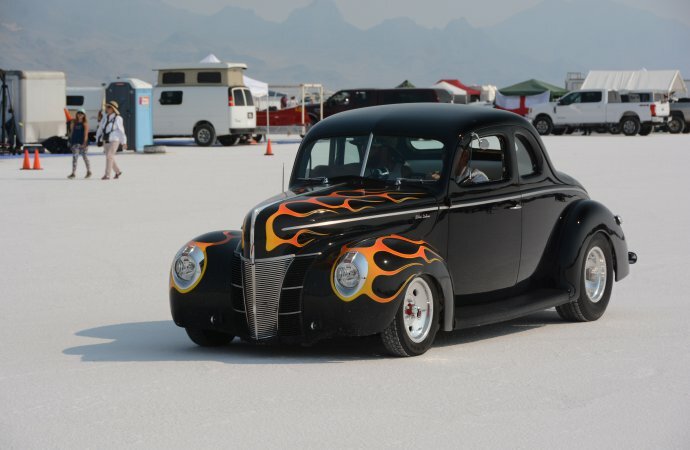 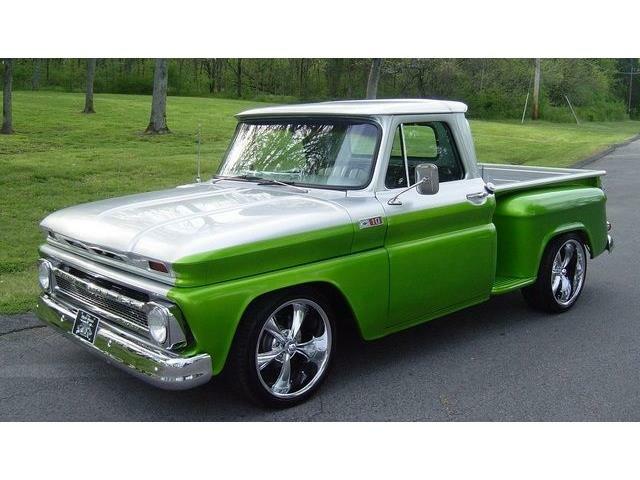 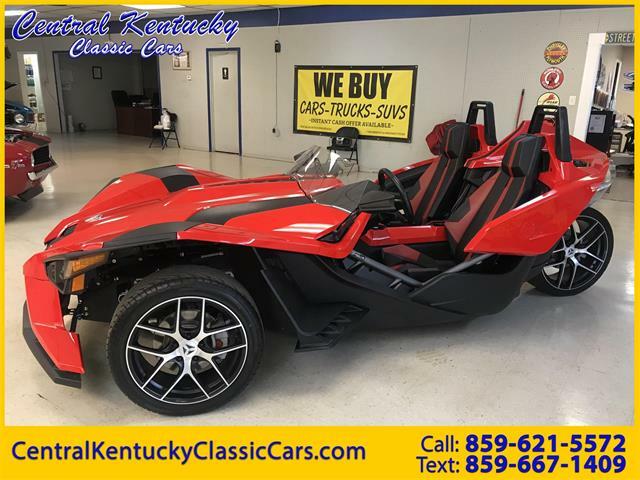 In between are hundreds of everything else, with an amazing array of hot rods, customs, rat rods and vintage rods driven here by the thousands of spectators. 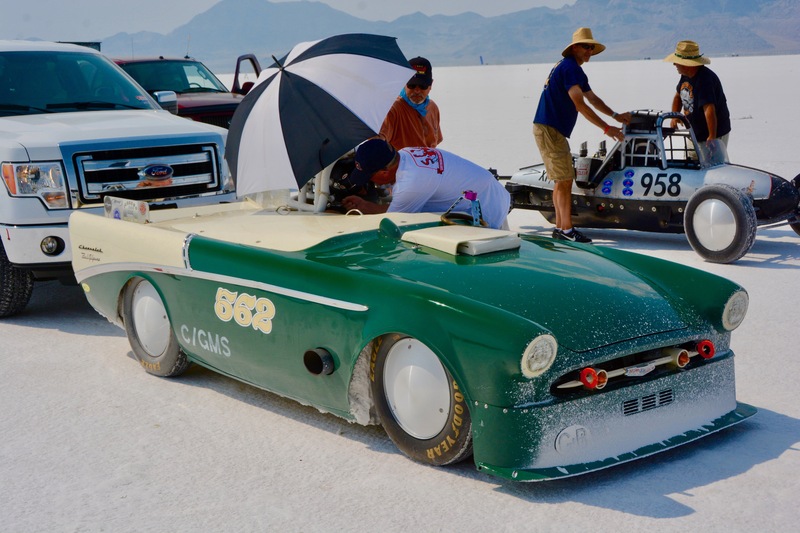 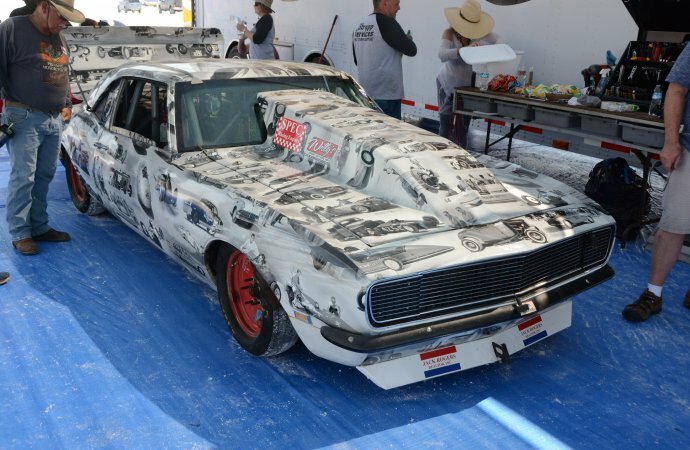 The photo gallery features few of our favorite vehicles from the 70th annual Bonneville Speed Week. 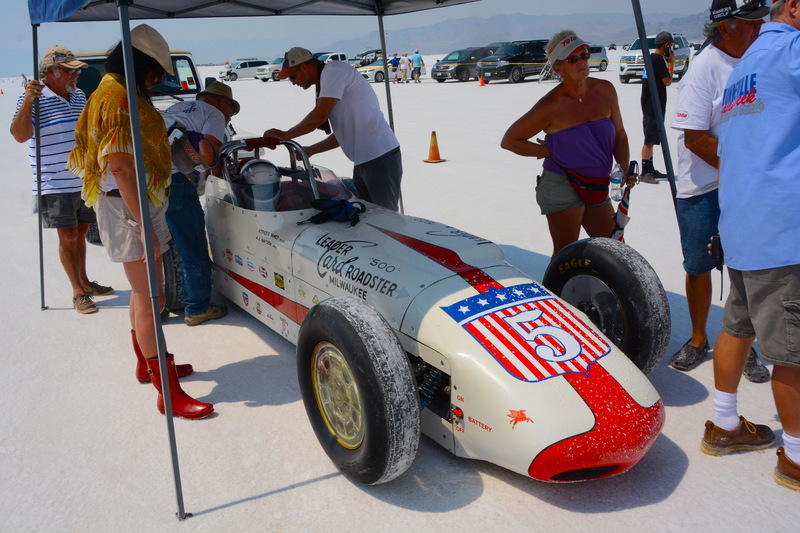 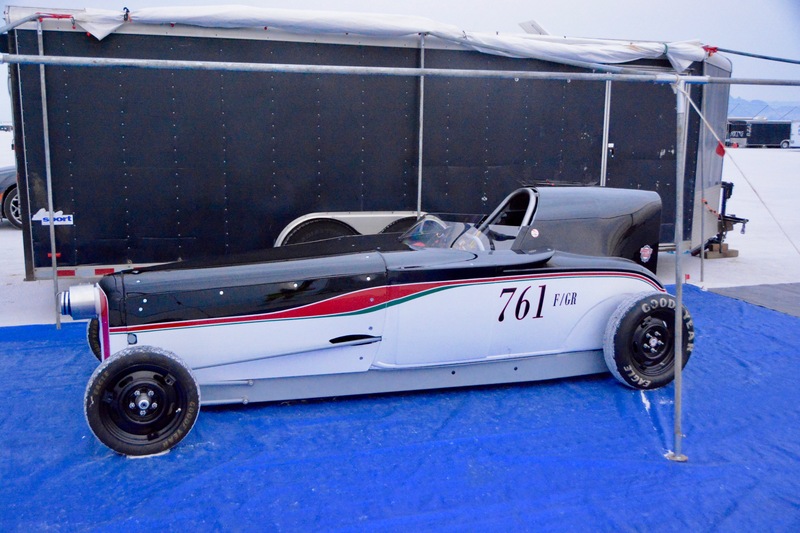 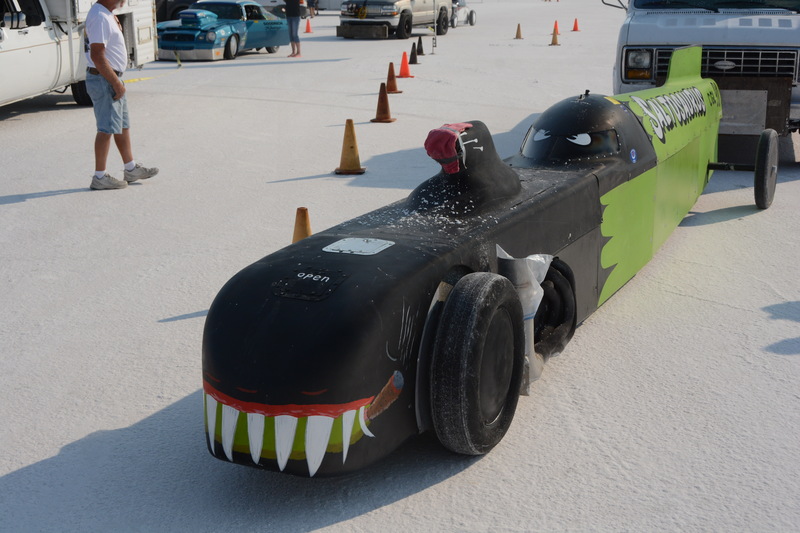 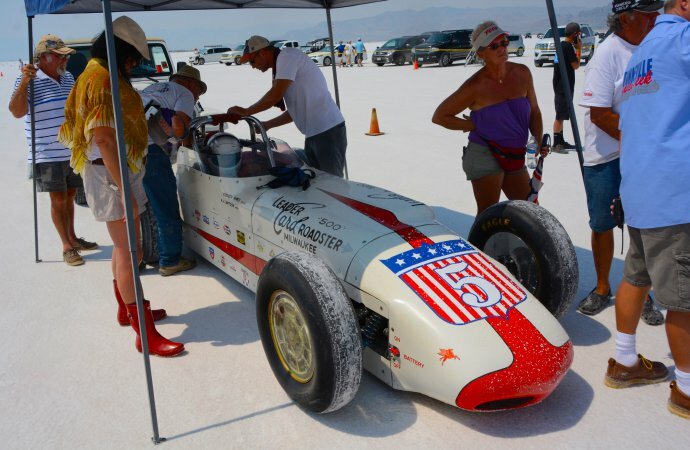 Do you have any information on the #5 Watson Roadster and how they did on the salt this past Speed Week? 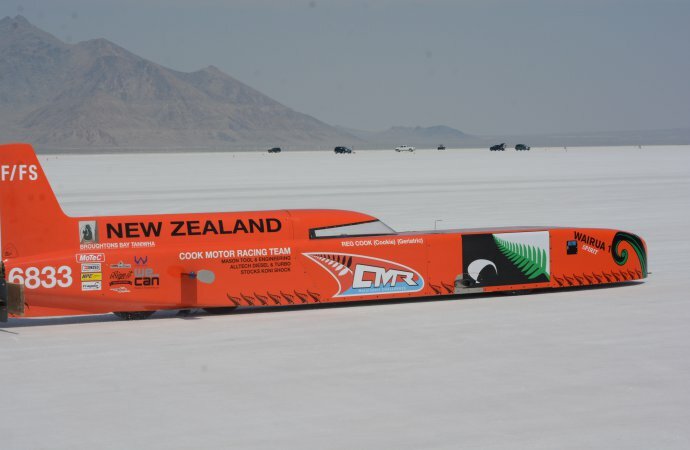 We heard they broke the speed record in their class, but we cannot find evidence of important information to substantiate the claim.